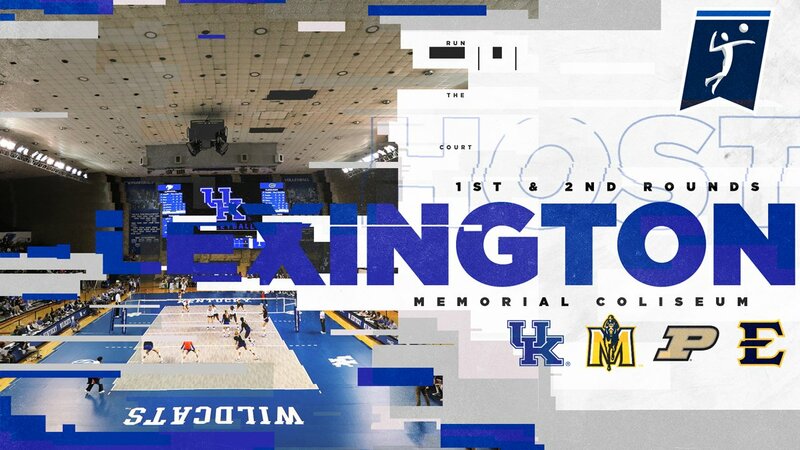 The first two rounds of the NCAA women’s volleyball tournament will run through Lexington, KY.
During tonight’s Selection Special, it was announced the Kentucky Wildcat volleyball team would be the No. 10 overall seed, where they will host Murray State on Friday at Memorial Coliseum in the first round. Kentucky finished the season with a 24-4 overall record to go with an undefeated 18-0 record in conference play. With a victory on Friday, the Cats will take on either Purdue or East Tennessee State in the second round. In other news, season awards have been released, and your SEC-champion Wildcats raked in just about all of them. 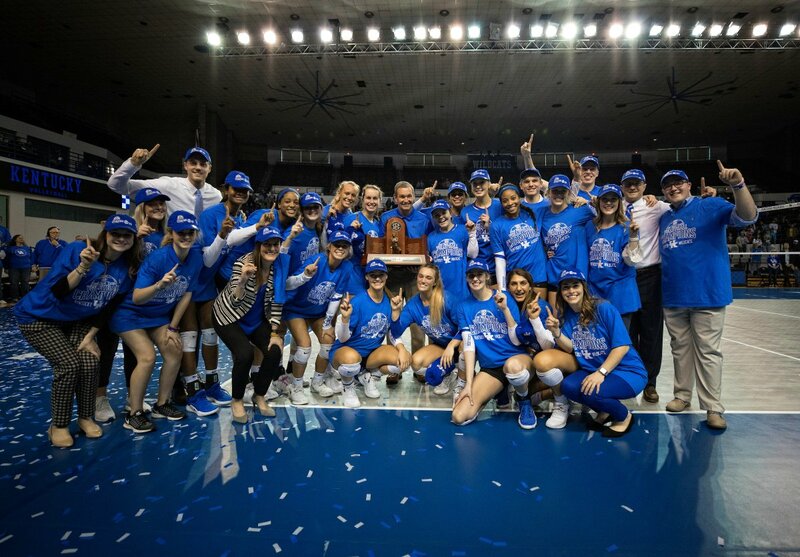 After a perfect season in conference play and their second-consecutive league championship, six total Kentucky volleyball players (and coaches) pulled in individual or All-SEC honors. In individual awards, star outside hitter Leah Edmond took home the biggest honor of all, being named SEC Player of the Year. Edmond is the first Kentucky player to win the award since Sarah Rumely did it in 2008. The star Wildcat had eight matches this regular season with 20 or more kills, hit for .297 in total, and posted three double-doubles, all while becoming UK’s all-time kills leader this season. Beyond Edmond, Gabby Curry took home Libero of the Year, while outside hitter Alli Stumler won Freshman of the Year honors. Head coach Craig Skinner also closed things out by being named SEC Coach of the Year, his third honor since coming to Kentucky and second in as many seasons. He was named co-SEC Coach of the Year last season. Middle blocker Brooke Morgan and setter Madison Lilley, along with Edmond, Stumler, and Curry, earned All-SEC honors, as well. Congratulations to the volleyball Cats, and best of luck in their upcoming run in the NCAA Tournament. While the football Cats were taking care of Louisville on the gridiron, the futbol Cats were making some history at The Bell. The No. 3-seed Men’s Soccer team beat Lipscomb 2-1 to advance to the Elite Eight of the NCAA Tournament for the first time in school history. Kentucky will play No. 11-seed Maryland next weekend at The Bell. The match will take place either Friday or Saturday, details TBA. Kentucky’s goals came from Jason Reyes (75′) and Bailey Rouse (82′). 1,939 fans were there to see the big win, which moved the Cats to a program-best 19-1-1 on the season. What a day for the ladies of the BBN. The UK women’s basketball team has defeated North Carolina 85-75 to clinch the title for the Paradise Jam’s Island Division. Kentucky also defeated No. 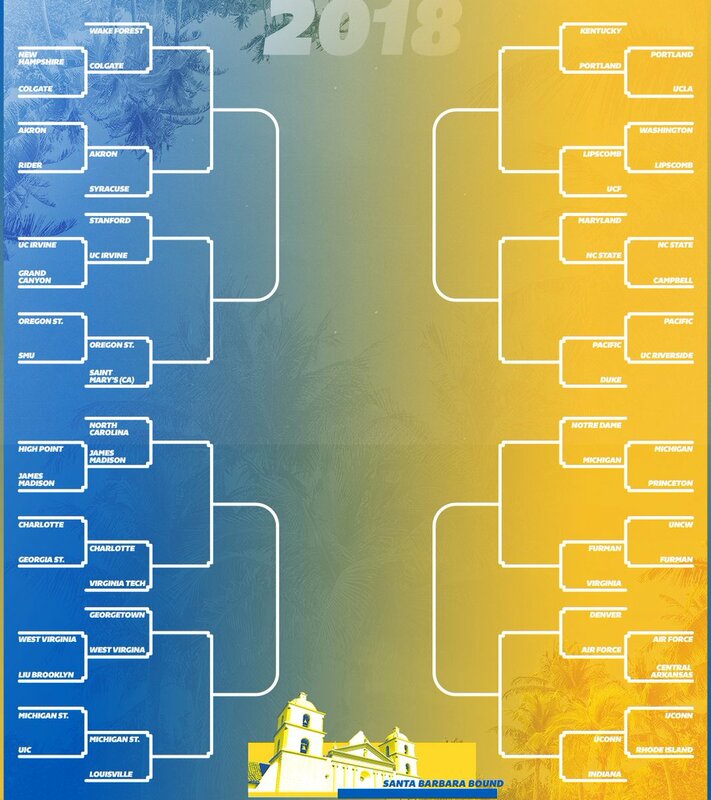 17 South Florida and UCLA in the tournament. While most of us were sitting around stuffing our faces with turkey, the UK Hoops team has been dominating in the U.S. Virgin Islands. Today’s victory over North Carolina sealed the deal for the Wildcats, and they’ll return to the continental U.S. undefeated so far this season, boasting a 7-0 record. The margin was close for most of the game, with the Tar Heels often holding the advantage. After trailing at halftime, the third quarter was huge for Kentucky. The Cats delivered, outscoring UNC 16-13 in that period. By the end of the third quarter, the Cats had cut UNC’s lead to eight. Then, the seniors got hot. Taylor Murray and Maci Morris both came out firing in the fourth quarter, draining three-point shots and getting to the stripe. After several trip to the free-throw line, Kentucky took control of the game and never looked back. The Cats finished strong, and they defeated North Carolina by ten points. The locker room was clearly a place for celebrations after the game (and of course, Matthew Mitchell took it like a champ). Today’s win was the latest in the series of three impressive victories for the Wildcats. They defeated UCLA 75-74 in an overtime thriller and beat No. 17 South Florida by a final score of 85-63. Freshman Rhyne Howard brought home MVP honors from the tournament. But they weren’t the only team with a big win today. The UK volleyball team just defeated Auburn to officially win the SEC Championship, finishing undefeated in the conference for the first time since 1988. The Cats won in convincing fashion – they swept the Tigers. Don’t worry, they got their share of post-game celebrations too. After a slow offensive start, the Kentucky women’s basketball team finished with a decisive 71-49 victory over the High Point University Panthers. Maci Morris led all scorers, finishing with a season-high 22 points. Taylor Murray added 14 points and freshmen Rhyne Howard and Blair Green had 10 points each. While the Wildcats had four players hit double-digit scoring, it was Kentucky’s defense that came out strong, especially in the second half, to win the game. UK held High Point to just 28.3 percent shooting while also forcing 19 turnovers. The Cats were able to convert these turnovers into 15 points. KeKe McKinney was a major contributor on the defensive side of the ball, grabbing a season-high nine rebounds and recording three blocks in 24 minutes of play. Kentucky outperformed High Point in every aspect of play – the Wildcats made a higher percent of their shots from the field and from behind-the-arc, they grabbed more rebounds, committed fewer turnovers, blocked more shots and sank more free throws. Overall, a successful day for Kentucky. The UK Hoops team is now 4-0 on the season. The victory was extra special for senior point guard Taylor Murray, who was honored for joining the 1,000-point club during the team’s last game. She is the 34th player in school history to hit a four-digit point total. And as if a win wasn’t enough, the Cats can now begin to look ahead to warmer weather. The team’s next three games will be played in St. Thomas, Virgin Islands, where they’ll take on South Florida, UCLA and North Carolina in the Paradise Jam. The action will begin on Thanksgiving Day at 1 p.m. when the Cats play South Florida. The No. 3-ranked Kentucky soccer squad is set to begin their run for an NCAA Championship today, as the Wildcats will take on the University of Portland in the second round of the NCAA Tournament this afternoon. This past Monday, Kentucky earned a program-best No. 3 overall ranking during the Selection Show and home-field advantage for their first three potential matchups in the tournament. 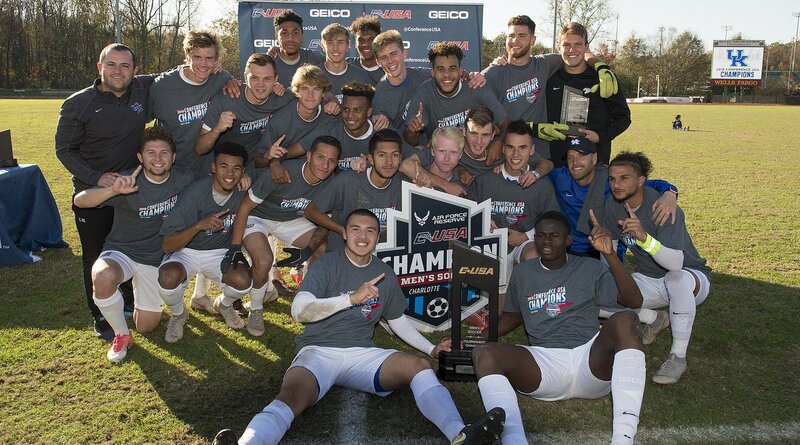 If they can pull off victories in each contest, they’ll find themselves in the 2018 Men’s College Cup in Santa Barbara, CA for a chance to win the title. So what should we know about the men’s soccer team and their run for the championship trophy? When, where, and against whom? Kentucky will open the NCAA Tournament this afternoon at 4:00 p.m. against the University of Portland at The Bell. Portland comes in at No. 21 with a 12-3-3 overall record, losing three of their last five matches. Despite the cold spell, the Pilots defeated UCLA 1-0 in the opening-round of the NCAA Tournament. 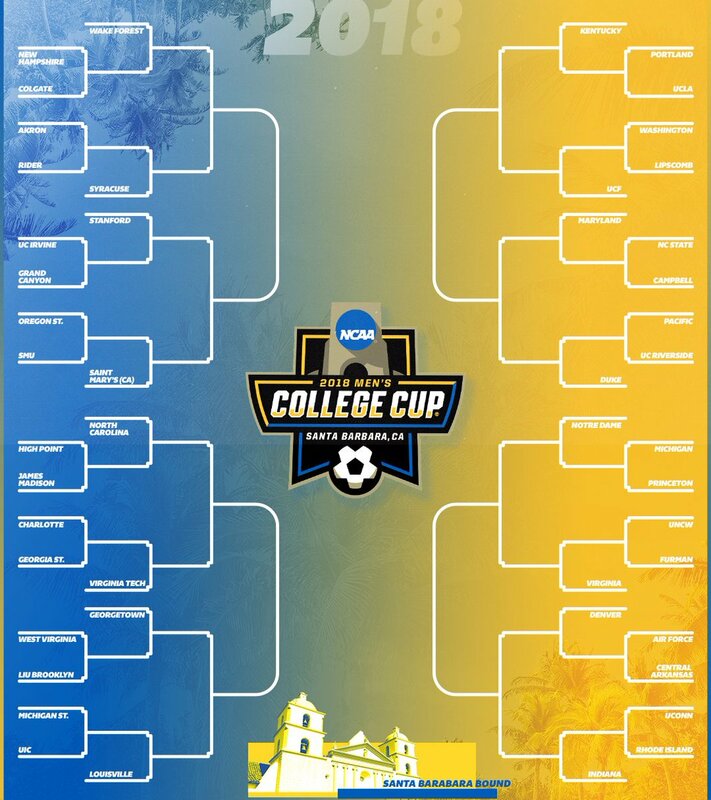 Portland has participated in 16 total NCAA Tournaments, making the College Cup in 1988 and 1995. If you can’t make it out to The Bell, you can watch on SEC Network+ or online on WatchESPN. Coming in at 17-1-1 overall and 7-1 in Conference-USA play, Kentucky has already had their best regular season in program history. They also took home their first-ever C-USA Tournament Championship, defeating No. 14 Charlotte 1-0 for the title last Sunday. It was the team’s eighth-consecutive victory. The Cats are dominating the competition, but they’ll have to overcome history in order to make their great season a special one. Kentucky has not advanced in an NCAA Tournament game since 2003 (penalty kicks), and their last outright victory came in 2001 against Mercer. In fact, they have never advanced beyond the Sweet 16, a feat they accomplished in 2000. To make matters worse, Kentucky is 0-4-1 at home all-time in the NCAA Tournament, so home-field advantage hasn’t been very beneficial to the Cats over the years. Coming in at 10-0 at The Bell, however, Kentucky is one of the hottest teams in the nation at home this season. What will win out in the end? C-USA Coach of the Year Johan Cedergren has led the Cats to tournament bids in five of the last seven seasons, but can he finally break through and get his first postseason victory this afternoon? The star of the show is JJ Williams, who took home C-USA Player of the Year and Offensive MVP honors. The junior stud recently increased his own school record of most points in a season (two points for each goal and one for each assist) with 38 overall. He has finished with 16 goals (third in the nation), including nine game-winners (No. 2 in the nation). With a goal this postseason, he will tie Riley O’Neill’s single-season record at UK. Kalil Elmedkhar has also been a key player for the offense this season, assisting on ten goals this season, tied for second-most by a Kentucky player in a single season. He also assisted Williams’ game-winning goal in the C-USA Championship last weekend. Beyond Williams and Elmedkhar, Kentucky goalkeeper Enrique Facusse has been dominant for the Cats defensively. With a .47 individual goals against average, Facusse is ranked No. 4 in the nation coming into the tournament. He is also top-10 in the nation in overall save percentage, stopping 52 of 61 shots this season. Despite a No. 3 overall seed in the tournament, UK is actually ranked No. 1 in the College Soccer News poll, a program-record. They come in at No. 3 in the Coaches’ Poll and No. 5 in the RPI. On offense, the Cats rank No. 6 nationally in total goals, scoring 43 on the year. Defensively, Kentucky has only allowed nine total goals, coming in with the No. 3 goals against average in college soccer. They have kept a nation-leading 13 clean sheets, as well, good for the best in UK history. Historically, Portland leads the all-time series 1-0 following a 2-1 overtime victory in 2003. This will be Kentucky’s ninth NCAA Tournament appearance in history. With a victory against Portland, the Cats would take on the winner of UCF and Lipscomb in the Sweet Sixteen. Kentucky has never advanced past the Sweet Sixteen, meaning history would be made with just two more victories this season. 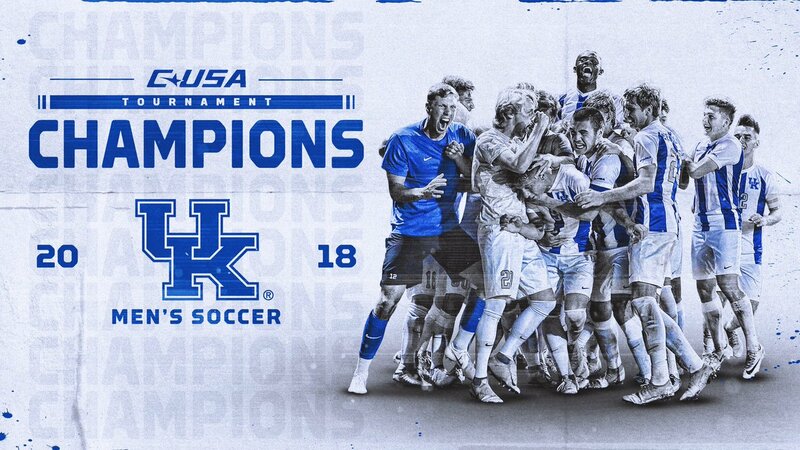 The University of Kentucky men’s soccer team earned the No. 3 seed in the upcoming NCAA Tournament, it was announced Monday via the tournament’s selection show. And with the No. 3 seed comes home field advantage as the Cats will host the second round at the Wendell & Vickie Bell Soccer Complex. Portland and UCLA will play in a first-round meeting out west, and UK will get the winner in the second round after a first-round bye. Go ahead and get your tickets here. Are you a student at the University of Kentucky? Do you like supporting your school’s women basketball team? Do you want a semester of your school paid for? Matthew Mitchell has one of you lucky students covered. When the women’s basketball team plays Virginia on November 15th in their annual game in Rupp Arena, Matthew Mitchell will randomly select one UK student in attendance and pay for their tuition in the 2019 Spring semester. Admission for UK students is free with their UK ID, which you will need to be eligible for selection. UK hoops will tip off against Virginia at 8:30 pm on November 15th in Rupp Arena. The game will also be on the SEC Network. They’ve done it! With a 1-0 victory over No. 14 Charlotte this afternoon, the No. 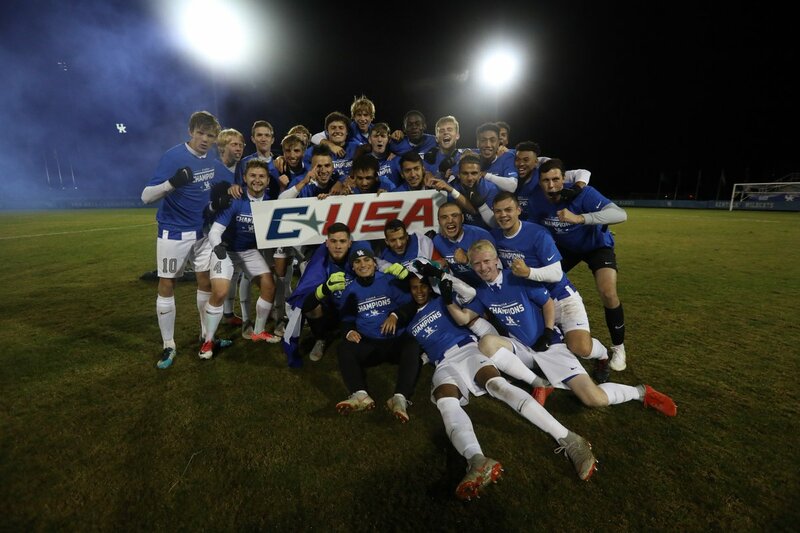 3 Kentucky men’s soccer team has clinched the C-USA Championship. JJ Williams scored the lone goal of the game 46:27 into the game, assisted by Kalil Elmedkhar. It was Williams’ 16th goal of the season. We’re a soccer school, anyway. If you are needing to curb your disappointment from the past week, the Kentucky men’s soccer team is kicking off right now in the Conference USA Championship game against host Charlotte. This season has been by far the best in program history for the Cats. The #3 ranked team in the nation has a record of 16-1-1 with the only loss coming against Florida International. Kentucky is led by C-USA Player of the Year JJ Williams who has scored 15 goals in 18 games to lead the team and conference. Kentucky plays in Conference USA for soccer due to South Carolina being the only other SEC team that has a men’s program. For the most part, the team has always been average, but this season they have exploded on the scene and taken the nation by storm. To watch today’s championship game, you can click this link! Maybe this will help your bad mood that has set in over the past week. I mean, we are a soccer school anyways, right? UK Hoops kicked off their season tonight with an 87-35 victory over Alabama State. Yup, the Cats won by 52 points (#Catsby50). The Cats and Matthew Mitchell came out fighting and set a hopeful and fun tone for the season. The first quarter started out slow, well, for everyone except Taylor Murray who scored six points almost instantly. At the end of the first UK Hoops only lead by one point, but then the second quarter started. The Cats went from a 15-14 lead to a 39-22 lead in just one quarter. Talk about playing fast. Maci Morris had back to back three’s, Taylor Murray kept shooting and fouls and turnovers went our way. Murray finished the half with 12 points, Morris with eight. The second half was an absolute bloodbath, I’ll resist the urge to compare it to a similar (more painful) event that happened last night, but I think you get the gist. UK Hoops played really fast with freshmen Rhyne Howard and Blair Green making the impact. The pair went a combined 11-0 run in the third, extending the lead to the 20’s and eventually the 30’s. Starting the fourth with a comfy 64-30 lead, and it escalated from there, to FIFTY-TWO-FREAKIN-POINTS. “It’s a good step for us just to get out there and say ‘that’s our style of play’ and let everyone know,” said Mitchell. Freshman Rhyne Howard went off scoring a whopping 15 points, most of which came in the fourth. Blair Green finished with 13, making the tow of them the first and second highest scoring freshmen in program history. Taylor Murray finished with 16 points and six steals, and Maci with 11. “She’s very quick…I kind of look up to her,” said Howard on Taylor Murray. Howard also said that she foresees a lot of three-pointers in future games. She went 3 of 6 tonight. My biggest takeaway from the season opener? We can score, and we can play fast. But, we will struggle against a team who’s bigger than us. ASU is small and we defended them easily. We outrebounded them and scored off their turnovers. We gained 51 of our points off turnovers, and most impressively, outrebounded them 43-35 and for offensive rebounds 24-9. But, we struggled in the post a bit. Against bigger teams, this is going to be a problem, but hey – tonight I’m all about the positivity. We really did play well, I’m just looking ahead to powerhouse teams like Mississippi State who we can’t hold to 30 points. “There may be a night or two where it doesn’t look very good, but we just have to be committed. We have the athleticism and potential,” said Mitchell. All in all, it looks like it’s going to be a great season for UK Hoops and I for one am excited to cover them on this great website for the third year in a row. I hope you’ll come out to some games and watch with me. UK Hoops plays Southern University this Sunday at 7 PM here in Memorial. Come on out! While the basketball team was taking care of business at Rupp, the men’s soccer team was winning a title at The Bell. Your No. 3 Kentucky Wildcats beat No. 24 Old Dominion 3-0 for the Conference USA Regular Season Championship. The Cats’ three goals came from Kalil ElMedkhar (1′), Jason Reyes (8′), and Bailey Rouse (49′). With the win, Kentucky finishes the regular season 15-1-1 and is the No. 1 seed in next week’s Conference USA Tournament. Now, Kentucky is a Basketball, Football, Volleyball, and Soccer school. Did you get your trick-or-treating over with last night? Come support the No. 12 Kentucky Volleyball team as they take on No. 11 Florida tonight at 7 p.m. at Memorial Coliseum. The Cats have won 13 matches in a row and are coming off sweeps of Georgia and South Carolina. They’re ranked first in the conference in hitting percentage (.295), assists (12.76/set) and kills (13.89/set) and are the only undefeated team left in the SEC, making tonight’s match absolutely huge. Don’t want to sacrifice your spooky celebrations? Don’t worry; there will be a Halloween bag and candy giveaway while supplies last and a costume contest. Per city ordinance, no masks are allowed. For the safety of those around you, props are also prohibited. Fans can purchase a ticket with the promo code ‘BIGBOO’ at ukathletics.com/tickets. If you can’t make it to Memorial, the match will be broadcast on ESPNU.